This article has been a long time coming because Instagram has changed a lot over the past several months and not just by design, but in how we use it. This year I have noticed a pretty big shift in how we behave, post and interact etc, and I know I am not the only one who’s picked up on this. In particular, the skincare community is not quite what it used to be. What started out as a fun way to share a burgeoning passion for skincare and connect with others has morphed into some sort of social media high school with cliques, gossiping and even bullying. I have been surprised, shocked and saddened by a lot of what I have seen recently and it has been so disappointing. There have been times when I have felt anxious over something that has happened on Instagram, wanted to cry over what has been said to me and even considered deleting my account more than once. The current vibe has been quite insidious at times and I frequently see antagonist condemnation, snide judgement and passive aggressive intimidation and not just from people, but from brands, too. I have seen a brand threaten to sue an individual for expressing an opinion, a retailer basically suggest that green beauty will prevent cancer (it won’t) and don’t get me started on all the accounts that have popped up with the sole goal of getting free products. There are so many lovely, genuine people on Instagram and a lot of good being done by sharing honest recommendations and experiences, but I think it’s time to address the negative underbelly to try and figure out how we got here and what we can do to change things before the whole thing implodes. 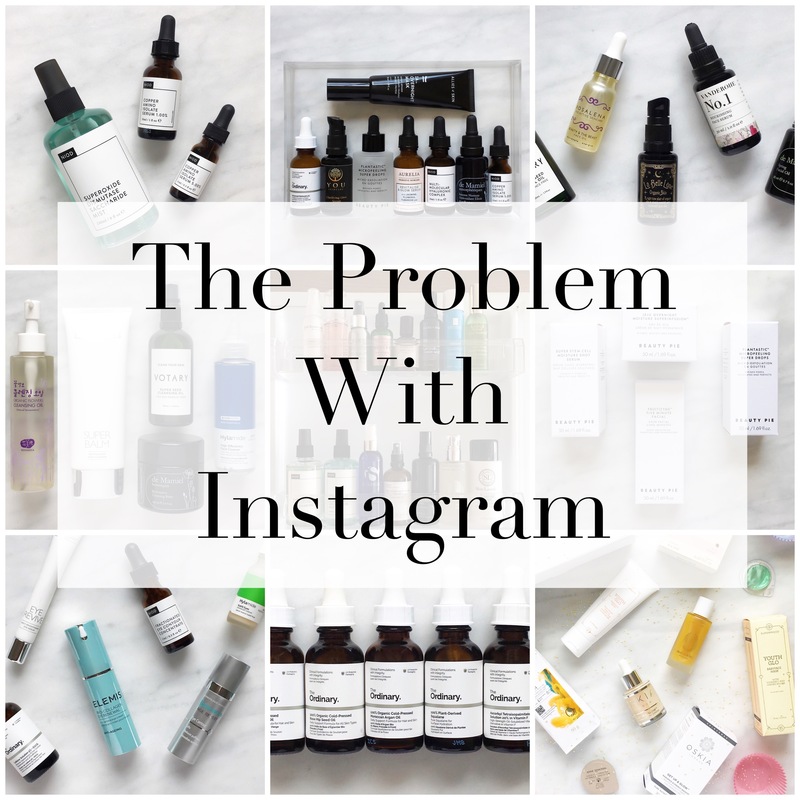 I created my skincare focused Instagram account just over four years ago now and even though I know there were issues back then too, it was generally a fun and enjoyable space. The skincare community was really small (many brands hadn’t even joined the platform yet) and pretty much everyone who posted was doing so without having an ulterior motive or hidden agenda. We just wanted to share what we were using and discover new products from each other – that’s it. Our views were candid, our pictures were unprofessional and we were just having a good time. Fast forward to today and that is not the case and I think one of the major issues is how Instagram functions now. Things went downhill pretty fast after the ridiculous algorithm was introduced and got steadily worse from there with the recent “shadow banning” concern and then official ads annoyingly showing up every 3-5 pictures in our feeds. Instagram has made it even harder for us to connect with each other in a genuine way and because of that I feel like the sense of camaraderie in the community is declining. The vibe isn’t the same at all and I see a lot of angry posts (some very valid), bitter comments and disrespectful remarks, sometimes over the most trivial things. I have seen posts that maliciously pit brands against each other, stories crucifying a product over debatable “bad” ingredients, brands being verbally abused for being out of stock and “mob justice” that boils down to nothing more than bullying. What’s worse is this is just the tip of the iceberg. What goes on behind the scenes in DMs and group chats is awful. I have been made fun of for liking Mondays (I just do), had false rumours started about me, been called fake for unfollowing someone I find dishonest (the irony) and attacked and harassed over a simple difference of opinion. This is cyber bullying and besides what I have personally experienced, I know of conversations and group chats that are only there to gossip, judge and laugh at others and like I said before, it’s just like being back in school. I have definitely been hurt by some of the things I have heard and read about myself and it would be so easy for me to retaliate and “shade the haters” or “expose” people, but at the end of the day, what would be the point? I would be acting just like them and I would rather ignore it and focus on my own account and the people who actually make this community a better place. I, like most of you, joined Instagram to connect, yet lately I have felt so alienated and isolated, but at the same time relieved to not be involved in the drama anymore and that’s a shame. Of course, this didn’t all happen out of nowhere and it has been brewing for quite some time. Two of the biggest culprits of this negative change are some of the brands and PR agencies, big and small. Many of them have tapped in to the word-of-mouth power of our community and are using it to promote and sell their products in a less than honest way. There are some that don’t want a genuine review, because wouldn’t an unofficial/undisclosed #ad in exchange for free products or the potential for them be so much better? This happens a lot and it is a major problem. One of the reasons the community was started was to offer an alternative viewpoint to what the brands say about their products, as well as the less than truthful reviews on some big retail sites. Now that seems to be getting completely lost in the race to rack up as many free products as possible. The excessive yet calculated distribution of “PR samples” or “gifted products” has created a sense of entitlement for (some of) those who get them and bitterness and envy from (some of) those who do not; so instead of connecting, we are competing for a brand’s attention or free products and instead of engaging, we are self-promoting and serving as a #ad for any brand willing to send freebies our way. Many accounts only function to please the brands they “work” with by posting overly staged and edited pictures and innocuous “reviews” that provide very little (if at all) useful information. I see so many posts that look like a #ad or #sponsored, yet the hashtags are never there. Oh, and if you’re wondering, please use the * to denote products that have been sent to you for free. It’s not that hard and the transparency would go a long way in helping the community stay honest. Also, if you ever have a question about anything I post, just ask! It has been disheartening to see the rampant lack of honesty, integrity and transparency going on from all sides, but the potential for free products as well as the rise in #sponsored posts have added a monetary value to accounts that didn’t really exist when I joined Instagram and again, this has encouraged more accounts to join the platform with the sole goal of getting free stuff and making money. I see accounts fawn over brands that send them free products because of how expensive they are with no regard to whether the pricing is ethical or justified (another issue for another time) or people complain about being bored of Instagram and upset about the lack of engagement yet have no issues with posting #ads back to back. These are usually the ones who reach out to brands offering to promote their products and claim to be “PR friendly” and again, this is an issue. The community is not here to serve brands or function as a way for them to sell their products. They can do that on their own accounts. In all my time on Instagram I have only done one sponsored post, even though I get offers daily. It’s not my goal, it’s not what I got into this for and the same goes for free products. I still say no to pretty much 90% of what I am offered because if I don’t have the time to genuinely review them, why accept them? I see accounts that churn out “reviews” every other week on products they’ve only had a short amount of time and some of them read like regurgitated press releases. We have let the brands take over something that was started for us, the consumer and in the process, have let them “buy” undue influence and loyalty in exchange for PR packages or worse, the hope of one. The other major concern that needs to be addressed is the unbelievable condescension and sense of entitlement going on right now. Remember back in the day (although it sadly does still happen) when we would go up to a beauty counter excitedly looking to buy something or get some information and the sales assistant would be snobby, condescending and/or patronising and often times, address us with a straight up bitchy attitude? Well, on Instagram at the moment that’s what some of us are doing to brands and other members of the community. Inflated egos spurred on by having a large following or being known as “real” or an “expert” (major eye roll) have allowed some accounts to think they can vilify brands and others over a simple difference of opinion. They behave like they have PhDs in everything and throw around the word “expert” like confetti and to be honest, it’s uncomfortable to watch. Access to information has had a big effect on how we shop and the level of customer service we expect, but this expectation can sometimes create the exact opposite experience to what we want, both online and in store. I have seen exchanges on Instagram escalate quickly and turn combative over the smallest thing and posts that condemn/shame a brand for not immediately pandering to our every whim or question. The easy access to pretty much anything we want to know has helped us become more informed consumers, but it has also spoiled us and for some, allowed them to believe they know more or better than the brands themselves. The sales assistants or social media managers cannot be expected to know as much as the brand’s founders or formulators. Of course, they should be trained and knowledgable, but they are also not robots with perfect recall and it takes time to learn about a product inside and out. If you find yourself in a situation where you know more about a product than the person who’s supposed to be selling it, good for you, but being smug or arrogant about it doesn’t help anything. I have been informally “studying” skincare for many years now and I feel like I have learned a lot, yet I would never think this limited knowledge makes me better than anyone else or gives me the right to attack a brand or person who disagrees with me. One of the most important things I have learned is that skincare is deeply personal. What works for me may not work for you and everyone’s skin is going to react differently. It’s OK for us to disagree, critique and discuss our experiences, but there’s no need to be vicious or disrespectful. It is perfectly normal for products or ingredients to not work for everyone. No matter what a product claims to do or what an ingredient can do, doesn’t mean it will; and that doesn’t necessarily mean there is anything wrong with it or the brand have lied about the ingredient, it just means it didn’t work for your skin for whatever reason. I have had this happen to me many times and have been very disappointed, but luckily there are so many other brands, products and ingredients out there to test that I don’t see the point in dwelling on what doesn’t work for me or trying to turn other’s against a brand or product over it (which I have seen happen more than once) because who knows? It might work perfectly well for someone else and usually will. We should absolutely be questioning brands and looking deeper in to the products we use, but social media has completely changed how we interact with brands, so instead of being antagonistic, why can’t we learn from each other and build better customer relations? For me, I prefer to showcase and celebrate the products that do actually perform well, support the brands I admire and buy from the retailers that don’t need to use cancer to scare us in to shopping with them. I would rather do that than troll brands I don’t agree with or rant about a product that doesn’t work for me. I know that negative posts get a lot of attention, but this is part of the problem in the community. Of course, you should definitely feel free to talk about and share your thoughts and feelings on whatever you like, but can we do it without the nastiness? One of my favourite accounts frequently discusses the issues on Instagram in her stories and uses humour to do it, which I love. It gets the point across without being aggressive and this approach sort of diffuses the issue instead of inflaming it. I have heard of people being afraid to voice dissatisfaction with popular brands for fear of a backlash and some feeling like they can’t express themselves properly because others jump in and shut them down. The community shouldn’t be like this. We should all be able to express ourselves, share what we love and have experienced and be critical without attacking. We should welcome each other’s differences and accept and respect a person’s right to like one product or brand over another without judgement. I mean, it’s just skincare – if we can’t be civil over something like this, what does it say about us? Also, I know how exciting it is when a new product launches and how frustrating it is to have to wait for things to be back in stock, but let’s all remember we are talking about products, not life-saving medicine. It’s not the end of the world and no, you are not entitled to compensation for having to wait for a £5 serum, so stop asking. I use Instagram in a very different way now and I’m half sad and half OK with it. In the beginning it was my goal to post at least once a week and four years later I am back to that, partly because I just don’t have the time at the moment and partly because it doesn’t feel the same with everything that’s going on. I’ve also had to unfollow some accounts (sorry!) due to the algorithm showing me five of one account’s pictures in a row and then none of someone else’s when I haven’t been on in a day or two. Essentially Instagram has forced me to keep my following count low so I can actually see everyone’s posts and it’s really frustrating. I have never done #follow4follow and always want to like and comment on the pictures in my feed, otherwise what’s the point in following the account? I know one of the biggest downsides of the new Instagram (for those who actually care and don’t buy followers/likes) is the lack of engagement and the sad thing is it’s happening at a time when people need the support and interaction the most. I know many of you are dealing with a lot in your personal lives and use Instagram as a fun escape and I wish people would reach out and talk more. I hate it when I see posts with no comments, except from bots (no thank you), which is why even though it is time consuming, I always try to properly look at each picture in my feed, read the caption and leave a genuine comment instead of just scrolling past. It’s my way of showing support and again, it’s why I can’t follow more people even though I want to. Interacting and connecting was the reason I joined Instagram, so I don’t want to miss posts from people who always comment to me just to follow back accounts that post often yet never say a word. Ideally, I would have less “ghost” followers and more communication, but it is what it is. Despite all this, it goes without saying that it’s not all bad and I still enjoy posting when I have the time. I have learned a lot through Instagram (from brands and people), discovered some brilliant products and made some amazing friends. I have seen kindness, generosity and compassion, and for the most part it is still fun. I know that sometimes it’s easy to get overly involved with platforms like Instagram because they do serve as a creative outlet and a much needed break from every day life, but I think it’s important to be tolerant, open-minded, and respectful when we interact with each other and brands. Kindness and integrity are severely lacking in the world as a whole right now and Instagram as a microcosm of society makes me sad for the state of affairs. Times are hard. I know it and I feel it. As I mentioned in my first blog post of the year (read here) I found it really jarring to post as normal when I felt like the world was hurdling towards disaster and I still do. I see accounts actively against the Trump agenda and practices, yet have no issues laughing and sneering at others and then threaten those who stand up against that. I see people that claim to be all about promoting positivity and conscious beauty, but behind the scenes all they do is gossip about others and spread hate. It might not seem like a big deal, but it’s all connected and it matters. The things we say and do on Instagram affect real people in real life, even when we’re berating a brand or business and we can’t forget that. None of us are perfect and all of us are just doing the best we can, and a little more kindness, humility and consideration for others would go a long way in making Instagram (and life) a better place to be. Where do I even begin with this? First of all, sorry for all the negativity you get just for doing what you love. I can’t even imagine what you have to deal with. This makes me quite nervous especially since I’m fairly new to the beauty community on instagram. I have been informally post about my skincare and organic lifestyle for years but never really on nstagram. I have an incredible love for skincare and got tired of not sharing it which was why I started a blog. With each post that I publish, I get increasingly uneasy because I feel as thought people will assume I’m a wannabe who just wants to make a career from blogging or Instagram (very far from it). But I’m learning not to let that stop me & I hope you don’t let any of these concerns stop you. I enjoy your blog so much because of just how detailed it is and couldn’t even imagine not seeing that anymore. I genuinely like your blog. I learned about you by fluke and I am really happy I found it. Your reviews are honest and you speak your mind. Really love it. I think what you say about Instagram, it happens in many other aspects of social media and life. As you mention, you might find difficulties, but I think you should also remember that you help people with your reviews and comments. That must be satisfying too! And most importantly even, you do post because you enjoy it, for yourself, not for anyone else. I understand what you say about the “ghosts”, I don´t generally reply or post, but it´s just mainly a lack of time, so I´m sorry!! I would be sad if you stopped writing, but you have to do what you think it´s best for you too! All the best Arly.